Enjoi was the first skateboarding company to set the trend of never using skaters actually skating in their advertisements. Instead ads, like the graphics on their boards, use witty, child-like imagery to depict skateboarding in a non-skateboarding way. The panda is emblematic to enjoi and has undergone many a transformation; it has been rasta-fied, given a Ziggy Startdust makeover, been shaped out of weed nuggets and been humped by another of its kind. 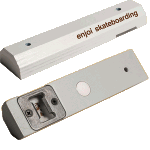 Enjoi is one of the few skate brands to successfully combine fun and functionality into its skateboard designs. rasta. Enjoi Colorful Little Buddies Allen Bolts 7/8"